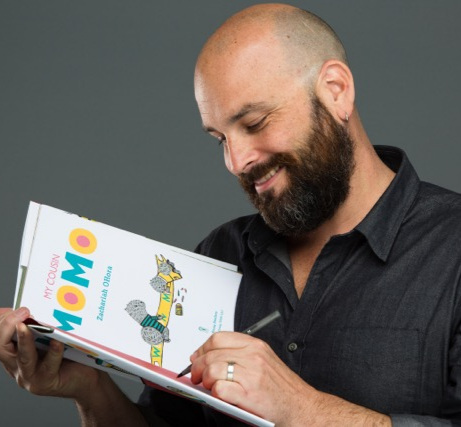 Zachariah O’Hora is the illustrator of the New York Times best seller Wolfie the Bunny. His debut as an author, Stop Snoring Bernard! won the 2011 Society of Illustrators Founders Award and was the 2012 State of PA Dept of Ed One book. His follow up, Not Fits Nilson! was named the Huffington Post Best Children's Book of 2013, a Kirkus Best Picture Book of 2013, a New York Public Library Book for Reading and Sharing and was given the PALA Carolyn W. Field Award. His book My Cousin Momo! was named by the Boston Globe a Best Picture Book of 2015 and was a Junior Library Guild Selection. His book The Not So Quiet Library hit shelves July 2016, and Niblet and Ralph followed in June 2018. He lives and works in Narberth, PA with his wife, two sons and two cats. Welcome to Fuzzytown! A tailored for each age group school presentation. 35-40 minutes for Pre K-K and 50 minutes for 1-5th graders. Keeping it Weird: In-depth discussion of personal references and influences with a focus on character inspiration, and an emphasis on embracing the slightly different, the odd, the cult, and straight-up weirdo elements that are the DNA of Fuzzytown. Outsider (Or How I Realized I Owe My Career in Kid Lit to the Devil): About OHora’s love and lifelong allegiance to public libraries. Thank you! We'll be in touch momentarily to explore options.